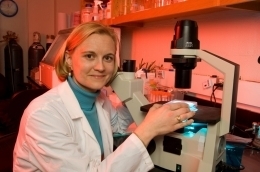 Kalmia E. Kniel - Kalmia E. Kniel, Ph.D.
Dr. Kniel knew from an early age she wanted to be a scientist, but until graduate school she focused on marine biology. It wasn't until she took cell biology courses and learned she enjoyed working on infectious diseases that she decided food science would be the perfect fit. "Kali has always had the drive and desire to think beyond the ordinary and investigate the unusual," remarked Dr. Susan Sumner, Dr. Kniel's PhD advisor and Associate Dean and Director of Academic Programs for the College of Agriculture and Life Sciences at Virginia Tech. "But I believe her greatest and most rewarding effect will be in the training of students to enter the food safety industry." CPS student staffer Alyson A. Barnes spoke to Dr. Kniel recently about her career path and research. Where are you originally from? Did it influence your field of study? I am originally from Rockville, Maryland, a suburb of Washington DC. I used to visit museums often, especially the Natural History Museum, and by the age of eight I was certain I was going to be a scientist. My father was a nuclear chemist and engineer. He certainly influenced my love of science and nature. One year in high school I even brought in a Geiger counter as part of a science project. My focus was originally in marine biology but I wanted something more applied. While teaching a pathogenic microbiology lab with Dr. Noel Krieg at Virginia Tech, I enjoyed working with infectious disease –and also gained interest in teaching at that point. What about the recent RFP led you to apply for funding? I started to work on fresh produce safety issues during my PhD work. I feel this is an area of tremendous importance and CPS is such a uniqe center where the industry can help identify the research they need to answer important questions. The leafy green industry in particular is crucial for good health and nutrition, yet has been vulnerable to the impact of foodborne outbreaks. I hope that our research can help reduce risks of contamination using novel and simple technologies. I am also interested in gaining a better understanding of how these pathogens exist in the environment. All the research supported by CPS is crucial to enhancing our understanding of this complex problem. Why do you feel your project, “Mitigation of irrigation water using zero-valent iron treatment,” was selected? What does the industry stand to gain? The use of zero-valent iron to remove and/or inactivate pathogenic microorganisms provides a simple technology that can be adapted to irrigation systems on the field and also to water treatment systems in produce processing. It is a technology that can be used in conjunction with chlorine, for example, with produce wash water. We hope to provide answers that will allow us to optimize this technology to reduce the risk of contamination from water used in the field. We hope to gain a better understanding of how the pathogens interact with the zero-valent iron and at the same time gain answers on how long a column filtration system works and what conditions are optimal for efficient removal/inactivation of pathogens. This is a hard question. I think food safety will always be an important issue. Consumers needs and desires change and the food science community is quick to respond. Many of these initiatives open up new food safety questions. I believe this cycle will continue. In five years I hope consumers will be better educated. I teach a variety of courses where food safety is an important topic and my students also feel we need to communicate science about foods, food production, and food safety in a better way to the public. People should be knowledgeable about risks and about their foods, but I think we have a long way to go for this to happen. In my research lab I have 10, undergrad and grad. They are all just as involved in the process as I am. From what my students share with me, I think the next generation of scientists will continue to work on communicating to the public about food safety. Could you describe a typical week for you - both in terms of your research and extracurriculars? A typical week for me involves teaching and working with undergraduate and graduate students in my laboratory. I do not get as much time in my lab as I wish, but I am fortunate to be working with an excellent group of students. As for extracurriculars I am quite busy with my two children, a 7-month-old daughter and a 5-year-old son. We enjoy spending as much time as possible outside, walking or hiking with our dog. I also love cooking and gardening, which my son also enjoys. When you look over your career to date, what accomplishments have been most meaningful to you? I feel very fortunate to have worked with an amazing group of people. Now that I am at the University of Delaware, I am blessed to work with creative thinkers and with an administration that is encouraging and energetic. I work alongside an incredible group of scientists and my lab is filled with dedicated students and professionals. I have developed two new courses that are based on my passion for epidemiology, food safety, risk assessment, risk communication, and infectious disease. I have the opportunity to share this information with many students who may not otherwise learn these things. I am also able to work with a lot of pre-veterinary students who gain from learning about food safety and the importance of animal health and quality in food production. Looking back, I also had excellent mentors during my post-doctoral work at the USDA-ARS Animal Parastic Diseases Laboratory where I worked on vaccine development and with protozoa. Before that I was given great opportunities by my PhD advisor Susan Sumner at Virginia Tech, who helped me get to where I am today.